We are positioned to improve even further the personalized and refined home and office design services for which we have become well-known and praised. Nicole Arnold Interiors is experiencing an exceptional 2014, thanks to their unique and personalized design approach that highlights enhancing the quality of life for each client. With renovations at both the City of Farmers Branch city hall and library and a growing roster of creative projects for private clients, the company is rising to the challenge of enhancing and preserving its core values and client-centric approach while growing to meet the demand. Consequently, principal designer Nicole Arnold is pleased to announce and welcome two more design professionals to the company - Maryanne Bennett and Kathleen Clemens. “We are very grateful to have experienced our continuous growth momentum this year. We’ve had the privilege of working with wonderful clients, vendors and contractors who trust us to steward our talents to them; and our business continues to thrive based on their referrals!” exudes company founder and principal designer Nicole Arnold who is also this year’s president of the Interior Design Society of Dallas-Fort Worth. "I’m excited about the talent both Maryanne and Kathleen bring to the team. With them on board, we should be able to service clients more efficiently and more effectively—one of our core values." Maryanne Bennett is a graduate of the Art Institute of Dallas with 20 years of experience with such prominent national firms as Marriott International as a project manager. She brings to Nicole Arnold Interiors an extensive background in planning and managing operations to successfully complete projects on time with maximum client satisfaction. Kathleen Clemens is a second-generation interior designer with degrees from Washington and Arizona State University. She will be working directly with principal designer Nicole Arnold. Kathleen is well experienced, having worked on a vast array of residential projects, including show and model homes as well as “boutique” commercial projects including law and realtor offices, retail and hospitality spaces. She has a keen, well-honed eye for color, architecture, culture and style. 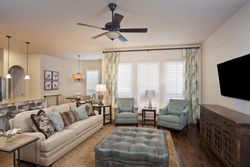 Nicole Arnold Interiors is a full-service Dallas interior design firm founded in 2008. Its exceptional service and design expertise has led more than 350 clients to retain and refer their services in the greater Dallas area. The company is recognized as a Dallas Top 10 Design firm and has received Houzz’s Best of 2014 Customer Satisfaction award. Led by Nicole Arnold, the company’s design style is best defined as transitional. However, Nicole’s unique design talents enable her to blend combinations of transitional, contemporary and traditional elements to produce an eclectic look, uniquely tailored to each client’s taste rather than focusing on a specific design category. Nicole and her staff excel in uncovering each client’s desired outcome, balancing aesthetics and functionality, to create his or her perfect space.